The first of a new recurring feature of vintage shoe print ads. Let's take a look at Nike Training's classic Nike Air Carnivore. Welcome to the first installment of the vintage sneaker print advertisement feature. The 80's and 90's were a glorious time for sneakers and the advertising was no exception. This feature will be a look at the days when we often got our first look at a new sneaker release not from the internet, but from a magazine. To start things off, I thought I would go with a real eye catcher, the Nike Air Carnivore Cross Trainer. The Carnivore is the epitome of a love / hate shoe. Originally released in 1993, it's still one of the wildest shoes ever designed. All those straps, that zebra pattern, that huge ankle sleeve...it's quite a shoe! 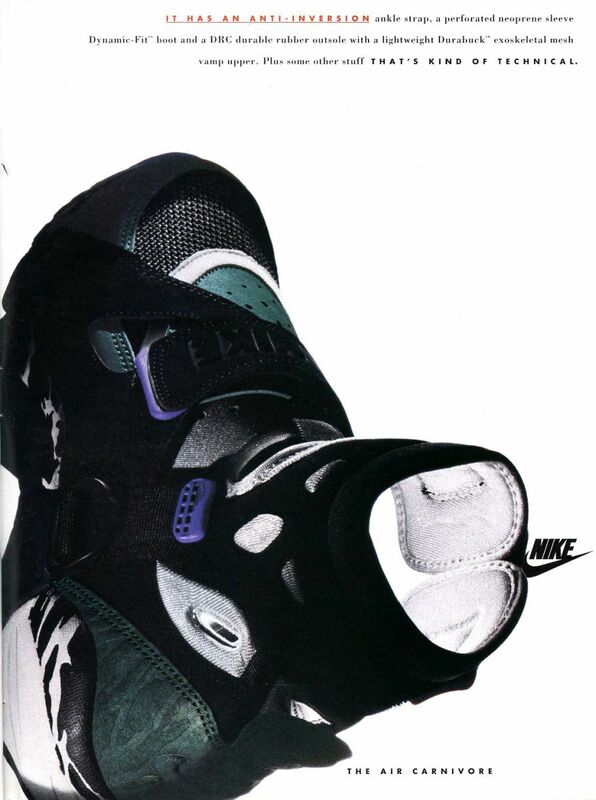 It was certainly the most technical shoe to date in 1993, which this ad helps emphasize.